Inspired by the colors gleaned from outside her Montana studio, Shelle Lindholm creates images with a innocence and playfulness unequaled by any contemporary artist. Shelle was chosen as a "Treasured" Artist in the State of Montana. 44x17.5 inches. Hand-crafted in MT & shipped in ~3 weeks. 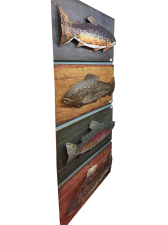 Specify Brown, Brook, Dolly Varden or Rainbow or get a set of all 4 at a discount.